Physics Buzz: Close Up of a Black Hole. Scientists recently aimed three radio telescopes at center of the Milky Way, zooming in for an unprecedented close-up of the supermassive black hole, believed to be located at the center of our galaxy. By combining the radio signals researchers formed a single mammoth-sized radio telescope, almost as wide as the continental United States. The results of study add to a growing pile of evidence that a huge (4 times the mass of the sun!) black hole resides in the Milky Way's center. They were able to obtain sharp detailed images, right down to the black hole's surface or event horizon, a region of space where the inward pull of gravity is so strong nothing (not even light) can escape it. Researchers focused on Sagittarius A a bright, intense source of radio waves. Scientists believe that Sagittarius A feeds off black hole activity, and may provide clues about the hole's position. At very high resolution, researchers observed the relationship between Sagittarius A and the black hole. 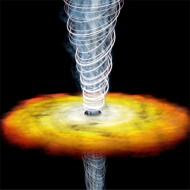 According to Sheperd Doeleman, who lead the study, light becomes distorted near black holes as gravity bends and magnifies it. The magnification creates an illusion, where radiation from the black hole appears to come from a region larger than it actually did. In fact, radiation will always appear to originate from regions of a minimum size.